When estimating energy from ADF, the ash content is unseen. Now that ash content is used to calculate the non-fiber carbohydrates (NFC), it is obvious that each 1% ash is 0.98% less NFC (and therefore TDN). While some minerals are necessary for the forage growth and may be beneficial to animals eating the forage, we want to keep the ash content to the minimum because ash provides no calories and, in fact, ash replaces nutrients. Ash in forage comes from two sources: internal, e.g. minerals like calcium, magnesium, potassium and phosphorus, and external, e.g. dirt, bedding, sand, etc. The average internal ash content of alfalfa is about 8% and of grasses is about 6%. Additional ash in a hay or silage sample is contamination with dirt, sand, etc. 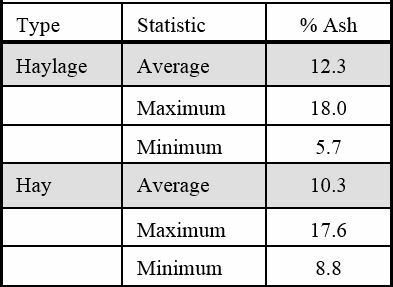 As shown in table 1, a summary of ash content of forage samples submitted to the University of Wisconsin Soil and Forage Analysis Laboratory, the average ash content of haylage is 12.3% and of hay is 10.3%. Assuming the silage is mainly alfalfa and the hay has a higher percentage of grass, forage samples are averaging about 4% ash contamination from external sources. Note that some samples have been as high as 18%. This means this farmer have fed almost 1 pound of dirt with each 5 pounds of hay or silage! Avoid harvesting lodged forage – as dirt often sticks to the downed forage when the soil is wet. This can’t always be avoided but can be reduced by planting varieties that stand better and by harvesting early in the spring to reduce the potential for a wind storm knocking the alfalfa/grass down. Raise the cutter bar of a disc mower – to lower ash and raise forage quality. Research suggests that alfalfa can be cut as short as 1.5 inches for maximum yield. Each inch above this height will result in 0.5 t/a less yield for the year. (Though, if the mixture includes smooth bromegrass, orchardgrass, or timothy, cutting height should be 3 to 4 inches to avoid shortened stand life of the grass). However, lower cut forage with a disc mower will have higher ash content when the soil surface is dry. Thus, raising the cutter bar lowers ash and raises forage quality while lowering the cutter bar results in greater yield. Each individual must decide on the trade offs they want to take but generally a cutting height of 3 to 4 inches seems best in most cases. Use flat knives on the disc mover – to pick up the least ash when mowing. Several disk knife types are available as shown in the picture. The flat knife at the left will pick up the least ash while the middle knife, at a 14 degree angle, will create some suction to pick up more downed hay and ash (when soil is dry). Generally, those settings that pick up downed hay best also result in the most ash content when the soil is dry so one needs to decide which is most important. Keep windrow off the ground – starting with a wide swath and placing the cut forage onto dense stubble will eliminate harvesting a layer of soil on the bottom of windrows. Putting hay into a wide swath also increases drying rate. The windrow should be high enough so that it can be raked or merged without the rake touching the ground. Keep rake tines from touching the ground – this can be done if the forage is on top of stubble and the ground is level. A rotary rake will generally include less ash because it is power driven and the hay can be raked without tines scraping the ground. 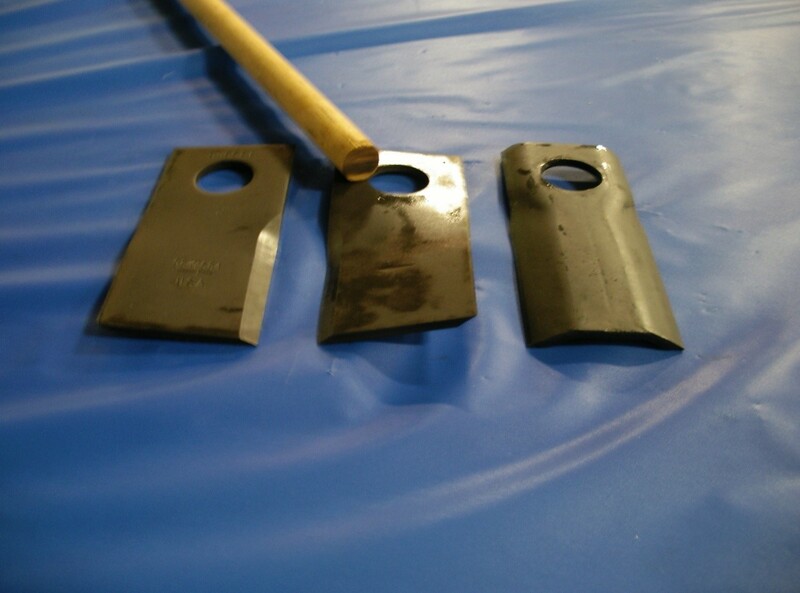 Wheel rakes are ground driven and tend to incorporate more ash; they should be adjusted with the maximum float that will still turn the wheels. We should visualize that, when we are raking and raising a cloud of dust, we are adding 1 to 2 percent ash to the hay. Minimize moving hay horizontally to reduce stones and other ash. It is better to move two swaths on top of a third in the middle rather than to rake all to one side. Using a windrow merger rather than raking will result in hay or silage with less ash content since the windrow is picked up and moved horizontally by a conveyer rather than being rolled across the ground. Merging can result in 1 to 2% less ash in the hay or silage. Mergers may not be economical for small operations but Custom harvesters may be an option to consider if merged hay with lower ash content is desired. Store hay bales off the ground since bales that set on the ground pick up water from the soil and mold. This molding process causes loss of TDN and increases the ash concentration. More important, the wet hay will pick up a layer of ash on the bottom if bales are sitting on the ground. Store silage piles/tubes on concrete or asphalt to minimize ash contamination during feedout. Silage can be removed with minimal dirt contamination from tubes or piles on the ground when conditions are dry but when conditions are wet and it is muddy around the silage pile or tube as much as 10 to 15% ash may be added to the haylage. There will always be some soil contamination of grass and legume hay or silage. However appropriate harvesting and storage management can reduce the ash content of the hay or silage. 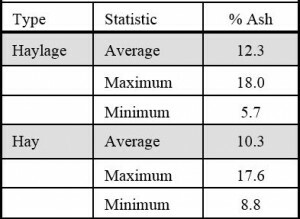 We should all try to be 1 or 2 % below the averages in table one. Anyone with 10% or less ash has done a good job of minimizing ash content of hay or silage.